We’ve just finished working on Fortune magazine’s annual list of the most powerful business women and it’s in the latest issue of the magazine, which is now on the net and will be on sale next Monday. 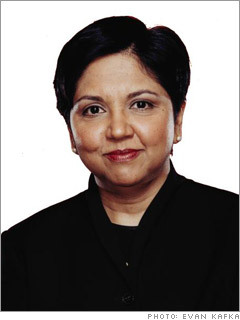 There are two lists of 50 women – one for the US, which is headed this year by Indra Nooyi of Pepsi (below) and one called International Power 50 for the rest of the world. Top internationally is Cynthia Carroll, ceo of UK-based Anglo American, the mining group, followed by Gail Kelly, ceo of Australia’s Westpac bank. But we’ve only got two new names from India in the list – along with Chanda Kochhar, joint managing director of ICICI Bank, who has been in before. She is tipped to be named as the next ceo and managing director within a few weeks, so is number 25. There are no more because most big Indian companies have not encouraged women to rise to the top. One of the two new names, at number 34, is Shobhana Bhartia, who became chairperson and managing director of the HT Media group following the death in August of her father, industrialist and parliamentarian K.K. Birla. She is also editor-in-chief of the group, which includes the Hindustan Times English language newspaper, the Hindi Hindustan, and Mint that is produced in collaboration with the Wall Street Journal, plus other expanding media businesses. Mint has raised India’s standards of business journalism. It doesn’t always have the newsiest news at the top of its sometimes quirky front page, but it produces a consistent quality of reporting and analysis, and keeps a regular watch on leading industries and companies instead of just writing about them when information is planted or easily available. The second new name, at number 44, is Kalpana Morparia, who was appointed J.P.Morgan’s first-ever ceo for India in August. A lawyer turned banker, who worked at India’s ICICI bank for 33 years, Morparia is respected in Mumbai and Delhi as an experienced banker. She was ICICI’s joint md till May 2007 when she became vice chairperson of its insurance and asset management businesses. I reckon she’ll be influential not just in India but also with JPMorgan abroad. It’s a tough task for the editors in New York to decide who should be in and in what order, and two Indian names have fallen off this year – Kiran Mazumdar-Shaw, founder and head of Biocon, the biotech company, and Naina Lal Kidwai, who runs the HSBC banking group in India. Ideally there should be more from India, but it’s not really possible to increase the number – and remember its just 50 people from all over the world outside America – because there are relatively few women at the top of large and influential private sector companies. There are of course many more well known names such as Shikhar Sharma of ICICI Prudential, Rajshree Pathy of Rajshree Sugars and Chemicals, Minosh Girotra of UBS Securities, Anu Aga of Thermax, Neelam Dhawan who recently moved from Microsoft to Hewlett-Packard India, Vinita Bali of Britannia Industries, Swati Piramal of Nicholas Piramal, Rohini Kalyani of Bharat Forge, Ashu Suyaash of Fidelity Fund Management, and several others. But there is no-one at the top of Tata companies, nor Reliance (neither Mukesh Ambani’s nor Anil’s), nor Wipro, Infosys, most of the Birla family businesses, Bajaj Auto, Bharti Telecom, Ranbaxy, Maruti Suzuki, Mahindra & Mahindra and Hindustan Unilever – the list is endless. Till these companies recruit and promote women on merit to the top, India’s list in Fortune will not get much bigger. The exception is ICICI Bank, which has made a name for itself by recognizing and promoting female talent. Three of the five members of the bank’s executive board, and 13 of its 40 top managers, were women two years ago when I wrote an article in Fortune (see picture) on all of them, including Chanda Kochhar and Kalpana Morparia, alongside that year’s top list. I spent a amazing three days interviewing them – all friendly, ambitious and vivacious. 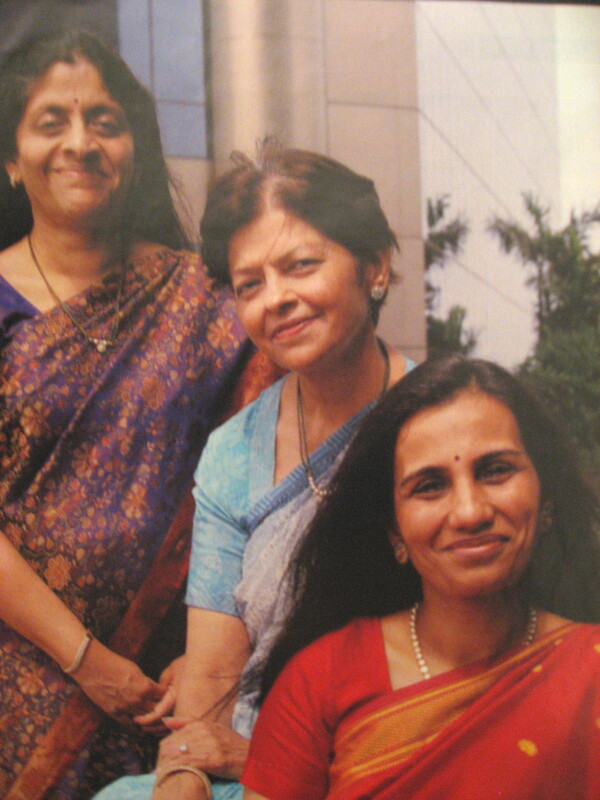 Once dubbed the “petticoat brigade” by Mumbai’s chauvinistic male bankers, these highly competitive women have helped build a business known for its aggressive and risk-taking attitude, and its growth from a sleepy, bureaucratic development institution into India’s most diversified and customer-oriented bank. “Almost all the leaders we have picked have succeeded, and most have been women,” K.V.Kamath, the ceo who has been responsible for empowering them, told me. He is expected to become chairman when he hands over his job to Mrs Kochhar. Closed minds also stop women moving to the top of more top Indian companies. 🙂 i work there,and in HR; so that is where I come from! 😉 But she is in the Management Committee which is the leadership of the company. But yes, you are right that one has to evaluate whether being in the HR function, one is able to influence the decision making. Thats another discussion altogether. Thanks for the reply! thanks bombaydosti for your comment and yes, of course, there is Leena Nair at HUL, but she’s an HR specialist and I was thinking more of top line management. Maybe she will be able to help get some women promoted up HUL’s elite 50 “listers”. Just checking, HUL has Leena Nair in the Management Committee of the company. Did you not mean that? Your topic is relevant! And i think the steps have to begin from education itself. Today, I think B schools also have embraced diversity as a policy – atleast universities abroad have. John Elliott’s analysis of Indian women powerlist is inspiring. Its really time the partiarchal old-style companies got the message.